Antwerp (Inglis: /ˈæntwɜrp/ ( listen); Dutch: Antwerpen, [ˈɑntˌʋɛrpə(n)] ( listen); French: Anvers, [ɑ̃vɛʁs]) is a ceety an municipality in Belgium an the caipital o the Antwerp province in Flanders. 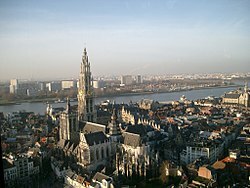 Antwerp's total population is 472,071 (1 Januar 2008) makin it the lairgest municipality in Belgium an Flanders in terms o its population. Its total aurie is 204.51 km2 (78.96 sq mi), givin a population density o 2,308 inhabitants per km². The metropolitan aurie, includin the ooter commuter zone, covers an aurie o 1,449 km2 (559 sq mi) with a total of 1,190,769 wi a total o 1,190,769 inhabitants as o 1 January 2008. The nickname o inhabitants o Antwerp is Sinjoren, efter the Spainyie wird señor, which means 'mister' or 'gent'. It refers tae the leadin Spainyie noble-men who ruled the ceety durin the 17t century. ↑ Statistics Belgium; De Belgische Stadsgewesten 2001 (pdf-file) Definitions of metropolitan areas in Belgium. The metropolitan area of Antwerp is divided into three levels. 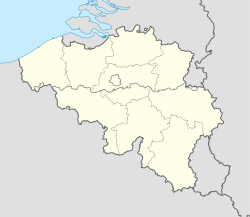 First, the central agglomeration (agglomeratie) with 715,301 inhabitants (2008-01-01). Adding the closest surroundings (banlieue) gives a total of 955,338. And, including the outer commuter zone (forensenwoonzone) the population is 1,190,769. Retrieved on 2008-10-19. This page wis last eeditit on 16 Februar 2018, at 20:24.